Knowing how to maintain cash flow effectively can be difficult for anyone responsible for the finances in a business. 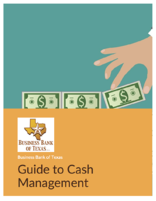 After many years of seeing business owners struggle with this crucial aspect of a business's financial health, we worked with cash flow expert Philip Campbell to assemble a resource to help. Get detailed, actionable advice by downloading this useful resource. Simply fill out the form to the right and we'll send you a copy.